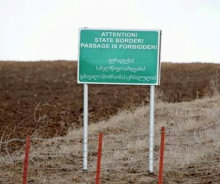 TBILISI, DFWatch–Russian border police detained a 31-years-old inhabitant of Tbilisi in the vicinity of the South Ossetian boundary line, Sputnik Ossetia reported. The man was detained on 24 February near the village of Akhmaji (Akhmadz in Ossetian) in Akhalgori (Leningor) municipality, which remains under the South Ossetian control. According to Sputnik Ossetia, this is already the sixth case of detention this year.